I saw Nirvana live just once—almost exactly 20 years ago. It was October 26, 1993, in Milwaukee, and the band was in a strange place, having released the follow-up to its world-altering Nevermind just six weeks before. Like a lot of 20-year-olds at the time, I was an unabashed Cobain worshipper: I even recall actually seeing a copy of In Utero for the first time. It was on vinyl, because the band insisted that LPs be released a week ahead of the far-inferior CD format. I was working at a record store, and we got a big box of clear-wax In Uteros in advance of the actual release date—it may have been one night before, it might have been that Saturday. In any case, I have a vivid memory of dropping the needle on the record—the moment felt that important. As it did for the rest of the listening public (and the band’s business associates), In Utero initially inspired some confusion and consternation in me. Nirvana had always had its abrasive songs and its pop-leaners, but In Utero seemed to be unflaggingly tipped toward the former, maybe to its own detriment: I’m guessing it was “Scentless Apprentice,” with its unrelenting chug and squall, that first caused that reaction. The album was confrontational, as was that Milwaukee show I attended, but I soon came to understand what a tricky, beautiful balancing act it represented: Nirvana played “Smells Like Teen Spirit” that night—to a not-full auditorium, the public perhaps unimpressed by the new record—but they ended the set with “Endless, Nameless,” the abrasive jam that served as Nevermind’s hidden bonus track. People left during that song—it’s long and deliberately ugly—and those who stuck around hoping for another, more accessible encore just got a sarcastic smile and wave from Kurt Cobain as he left the stage. He knew what the crowd wanted and what it didn’t, and he was insistent on delivering both. I’m not sure when it became clear to me (or pretty much every rock critic on the planet, or a good percentage of diehard fans) that In Utero is the best of the three Nirvana studio albums, but it did. There will be a dozen or more Internet essays this week detailing differences and justifying rankings, and I’m not interested in that. Some contrarian will make an impassioned plea for Bleach, someone else will argue that the band’s best songs actually appear on the odds-and-sods compilation Incesticide, and a populist or two will try to put In Utero (and, by extension, the dead singer-guitarist) in its place by championing the people’s choice, Nevermind. I’ll just say this: Each is essential. In Utero is my favorite. Almost 20 years to the day after its release, In Utero is getting the super-deluxe treatment, with three CDs and a DVD, as well as some pretty ace packaging. The greatest proof that times have changed is the heavy-duty participation of engineer Steve Albini: Though it almost seems quaint now, the fact that Albini recorded (never “produced”) In Utero was a huge deal in 1993. Here was a guy sure to remove any semblance of pop structure from the band and turn it into The Jesus Lizard, or worse. Depending on who you believe, Geffen Records was anywhere from indifferent to livid about Nirvana’s choice to use Albini. But it’s clear why Kurt Cobain wanted to: He wanted In Utero to sound markedly different than Nevermind, with its slick recording (courtesy Butch Vig) and even slicker mixing (courtesy Andy Wallace). If there’s a reason Nevermind has aged poorly—and I’m only half-saying it has—it’s because of that slickness. Albini, Cobain knew, could capture the band at its rawest, and he did. According to Albini, many of the performances on In Utero were first or second takes, which is the way he and the band liked it. But if this deluxe set is any indication, history has vindicated Albini’s take on In Utero. Not only does it include his original mixes, but also an entirely new mix he did earlier this year. Only the most diehard fans will notice a ton of difference: Mostly the 2013 In Utero just sounds a lot roomier and a bit sharper. The vocals are up; the mean parts sound a little meaner, the gentle parts a little gentler. But the fact that he’s the biggest voice on this re-issue—and, more than that, just listening to the original record—proves that the band members’ instinct to go with their contrarian guts was the right one. It was that shared attitude that made songs like the roaring “Frances Farmer Will Have Her Revenge On Seattle” and the sweetly angry “All Apologies” work. Gloss would have made them sound flat, when what they needed were real-life bumps and bruises. In addition to Albini’s new mix (and his original mixes of the two Scott Litt-remixed tracks), this In Utero piles on the demos and B-sides, most of which have been pretty widely circulated. The studio tracks range from free-form nonsense (“Gallons Of Rubbing Alcohol Flowing Through The Strip”) to absolute essentials (“Sappy,” which also got a 2013 Albini mix). 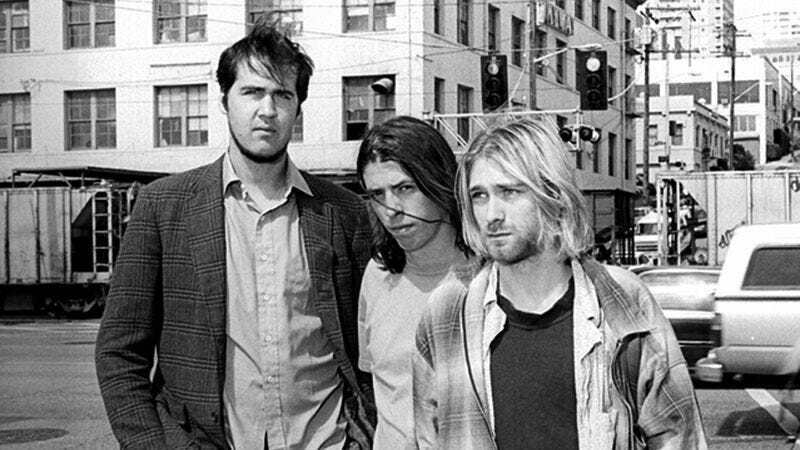 The demos are, for the most part, for fans-only: Most are instrumental versions, with just “Scentless Apprentice” and “All Apologies” delivered with Cobain’s vocals. The only two pieces that the diehards—a.k.a. the people who’ll want this set—won’t have heard are a pair of new songs whose titles hint at how inessential they are: “Forgotten Song” and “Jam.” The former builds on a riff that might’ve one day become an actual Nirvana song, and “Jam” is exactly that—a wanky, noisy six minutes that’s useful for historical purposes only. That’s all frosting anyway, on a bitterly beautiful cake. It’s the original 12 songs on In Utero that stand as Nirvana’s final statement. It’s funny, ugly, and as near to perfect as a band that isn’t interested in perfection might want to get. It’s hard to believe that it’s been 20 years since I first dropped the needle on In Utero, then watched the band win over a crowd before deliberately losing it. Like most great art, the intention wasn’t immediately obvious, but the genius revealed itself over time.